FUN FOR ALL AGES, with great food, music, games, raffle prizes, under a big tent! 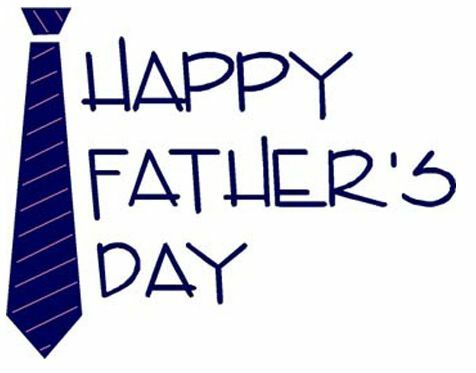 We are providing the Brats, Burgers, Hotdogs, fixings, non-alcoholic beverages, games, prizes and a huge cake!! And…. Don’t forget to wear your blue Church logo teeshirts!! Any questions, please contact Rene at (714) 330-3765 or the Office at (714) 536-6913. There will be a Ladies’ Retreat at Sacred Heart Retreat House September 16-18, 2016 in Alhambra. Enrollment forms have been sent out to all past retreatants. There will be forms pinned on the bulletin board in the Church vestibule for anyone who did not get a form or is interested. This is our “annual spiritual checkup.” Retreat Master is Rev. Andrew Apostoli, CFR (watch him on Sunday evening on EWTN around 5pm). Fees have gone up, and range from $75 to $285. ALL FORMS AND CHECKS must be sent to Yvonne Rochester. Her address is on the first page, but her zip code is incorrect. It should be 92648. 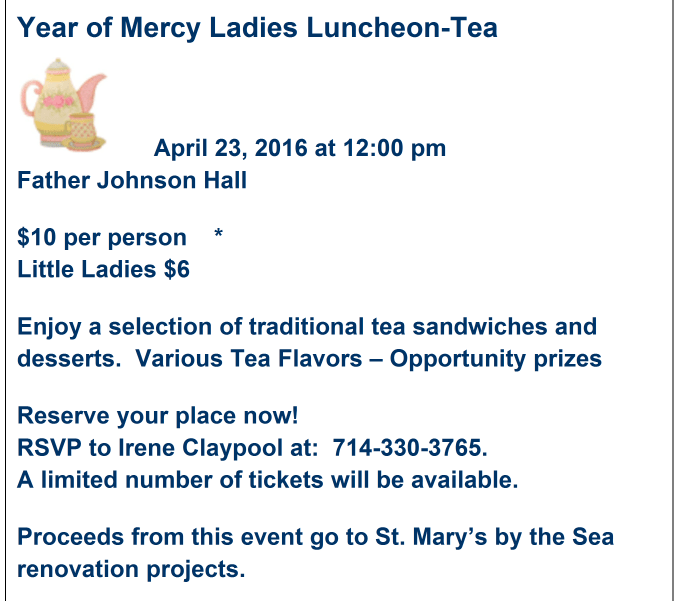 For more information, please contact ANN (714-536-8927) as soon as possible. Retreat room assignments are first come, first paid, first served. Also, call Ann if you need a ride. Fr. 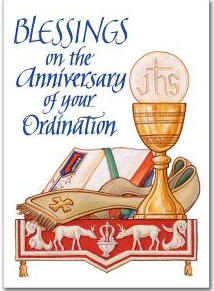 Quang’s 25th Anniversary of his Ordination is June 8, 2016. 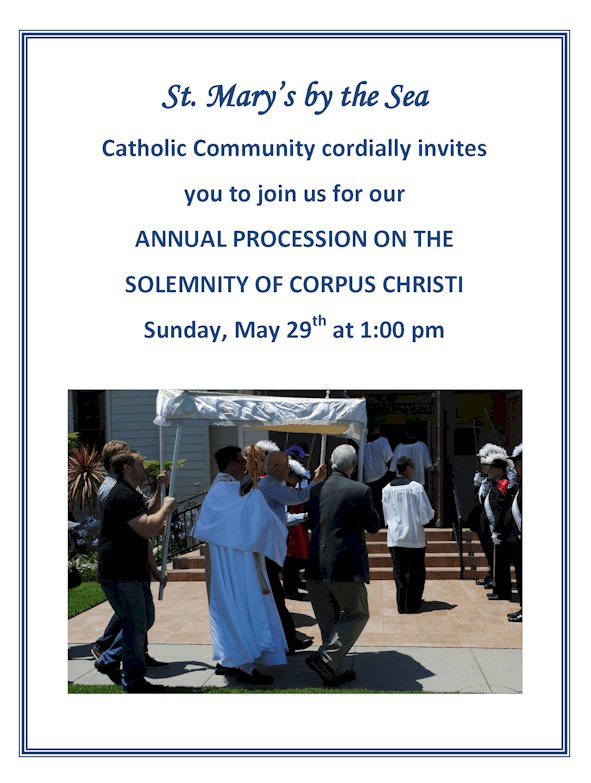 We will be celebrating this momentous occasion after all the Masses in Fr. Johnson Hall next Sunday, June 12th. Come join us for some cake and congratulate Father on his 25 years of leading his flock. SET UP for Pre sale SAT, JUNE 4th at 10am. Assisting with SALES & CASHIERING during the pre sale after AM Masses next Sunday, June 5th 8am-12pm. Any available Stewards please join the “CLEAN UP CAVALRY” @ NOON, June 5th AFTER our pre sale to put Fr. Johnson Hall back together again. SET UP on Thurs, June 9th @ 4pm!! 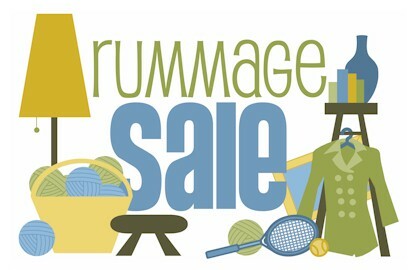 Our TWO Day RUMMAGE SALE is FRI, June 10th and SAT, June 11th from 8am-1pm; help US with SALES, CUSTOMER ASSISTANCE, SECURITY and CASHIERING. HELP to clean it all up afterwards (our most demanding job); SO we’re calling for the “CAVALRY CLEAN UP” @ 1pm, SAT, June 11th. To request a specific job, contact Rene Claypool @ (714) 330-3765 or Jacky Roza @ (714) 396-5761 ASAP. Since Mother’s Day on Sunday, May 8th is a celebration of all mothers, roses will be given after the 5 pm Vigil Mass on Saturday and after all the Sunday Masses as a thank you for your donation to the Life Center. 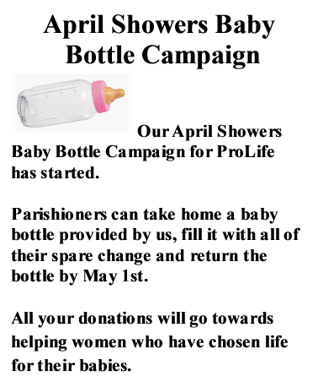 Your donation will provide significant financial support for all of the Respect Life Centers and Clinics that provide shelter and support for women with crisis pregnancies. 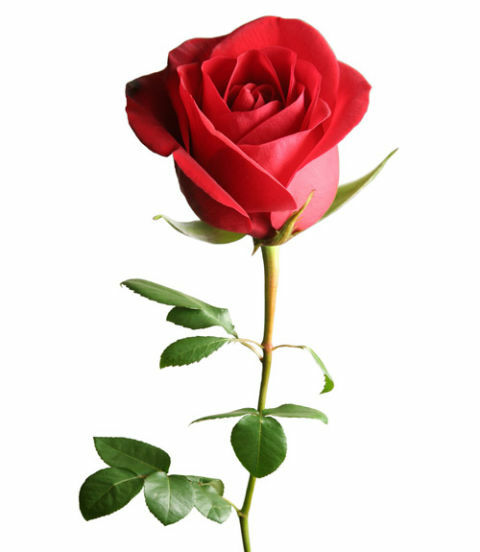 Consider making a generous donation and choose a thank-you rose for your Sweetheart, your Wife, Mom, or Grandma!